SUMMARY: Foundations of learning theory. Including some reference to historic scientific work. AUDIENCE: A must-read to all wannabe behaviourists and for science-curious owners. REVIEW: I very much enjoyed this book. The author’s PhD in animal behaviour gives the text the academic credence. This is not insignificant in the ever so muddled and subjective political world of dog publications. 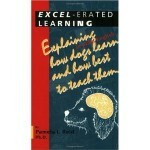 The book seeks to offer an comprehensive, balanced summary of the contemporary body of knowledge on dog learning. The book explains the learning principles, sprinkling them with examples of significant supporting research (Skinner, Pavlov, etc.). The book is structured in a logical manner, making it a flowing, convenient read. It introduces the core concepts that any dog trainer should be familiar with, such as conditionning, punishment/reward, extinction, etc. I was particularly impressed with the objectivity and honesty with which she tackled the more political subjects, like use of aversives in training. Browse the Book Review archive. Genre: pop science. Author: Reid Pamela. Reading Level: Owners, Professional. Star: 4. Bookmark the permalink. Post a comment or leave a trackback: Trackback URL.